You wake up one day and are completely overcome with a gut-consuming desire for Cafe Mama’s creamy ricotta cheese salad, or savoury kimchi carnitas fries from Vatos Urban Tacos. Problem is, there’s sure to be a mile long line up of people waiting at these restaurants (as there often is for popular establishments in Seoul) and you’re pretty sure your stomach won’t wait. You resign yourself to foraging through your empty fridge for last night’s kimbap, or think about ordering yourself some Korean fried chicken, but then remember Gourmet 494. Located in the basement of the eye-catching Galleria Department store, Gourmet 494 is the brainchild of some genius who (I think), basically wandered around Seoul to find the trendiest, most popular restaurants in the city’s current food scene, and put them all in one luxurious food hall. Pastries and coffee from Eric Kayser? Pizza from Pizzeria d’Buzza? Check. Burgers from Brooklyn, the Burger Joint? Sure. Sushi from Matsumoto? Oh yeahhhh. And of course, we can’t forget dessert. How about homemade tarts from Tartine, or experimental ice cream from Fell and Cole? For me, Gourmet 494 is like some kind of ridiculous food nirvana, where it is actually possible to satisfy your gluttony with a meal made up of all your Seoul favourites. And best of all? You won’t have to wait in line. When you get tired of gobbling everything in sight, you can peruse the amazing international cheese selection in the grocery, scrutinize the chefs working in the open kitchens, or post all your drool-worthy food photos to your Instagram account using the free wifi. Gourmet 494 is easily accessed from Exit 7 of Apgujeong-Rodeo subway station, on the yellow line. 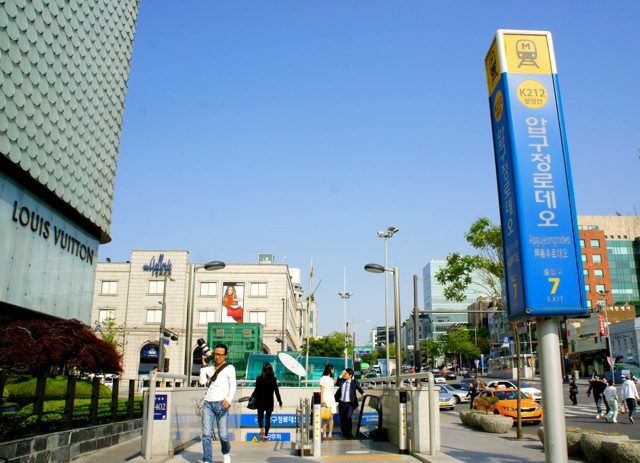 Lol… actually I was very confused by Apgujeong Rodeo station too, because they built the subway line while we were away on our RTW (seriously subway stations go up around here like pop-ups), and I just couldn’t understand that there was another Apgujeong station. The Rodeo station IS way more convenient for things though, that’s for sure. There’s a new COEX station opening up soon too, and I’m sure that will confuse everyone trying to get there too. Haha, but it’s definitely a needed station. Everything there is pretty darn delicious if I do say so myself…though I still have a lot of places left to try there. 🙂 Oh yes! You must visit Seoul one day…even after living here for 5 years, it’s one of my favourite cities i the world. I think it will surprise you!